This week images from one of the key areas of the house - the kitchen. Kitchen utensils, kitchenalia in general, vintage kitchen, people in the kitchen, food in the kitchen.......whatever involves the kitchen. Either exisiting images or new ones, shot on Pentax of course, and feel free to have a snack if you are shooting a new picture. Have fun. In the Kitchen hasn't generated as many entries as I'd hoped, but the quality of the images has been very, very high. There have also been some terrific ideas and I always like to see some lateral thinking! Perspicador, hot off the mark and first up as usual, presents us with a very appetising loaf of bread. The colour and texture are spot on. Perhaps a smaller aperture to give us a bit more depth of field? The only other thought is that it's a fine image of a loaf of bread, but in the context of the competition it could be anywhere, not just “In The Kitchen”. The Way We Were by tyronet2000 – There is huge potential shooting scenes such as this in the wide variety of small museums around the UK and probably elsewhere as well. This is precisely composed, shows just the right amount of information and is an interesting kitchen without a doubt. In terms of exposure a bit of overall darkening would be beneficial as the blacks don't quite have the depth I expect and there are a couple of small areas where the image is blown out. Preparing Tea For The Cricketers by noelm – Excellent, a great scene that will be familiar to many of us. The precision of the foreground, the blue framing and th intense look of the main subject all make the shot. The second person in the background is unfortunate in that she is partly hidden and it would have been much better if the photographer could have waited for her to be in a more suitable position. I like that the outside scene through the window is not totally washed out. If it could have been correctly exposed as well as the interior that would have been brilliant, but then we would be talking of lighting or HDR and the spontaneity would be gone. Watching His Cakes Rise by GlynM – A great idea, very different, and it works. The lighting on the left of the image is a little on the bright side, which does distract, so toning that down could be worth trying. Otherwise, it's a great shot and the subject matter much more interesting than the average TV show, so no wonder he's watching the cakes. Rural Kitchen by MikeInDevon – A great subject, really enhanced by the warm central lighting. I feel that darkening the image slightly would improve it and I see that in a few images. I suspect that the camera exposure is being used, but dialling in a bit of negative exposure compensation at the taking stage would help to make sure that a darkish subject remained dark. I am assuming of course that is what the photographer wanted and if not, then that's fair enough. Field Kitchen by Nigelk – A real kitchen in use this time, and what could have been a very severe lighting situation handled superbly well. Half a leg at the right hand side needs including in its entirety or removing for me, perhaps including if possible because it would then explain the long shadow that would otherwise be a bit on its own. The whole thing looks great though and if you do this routinely I really hope the experience is as good as it looks! No Mod Cons Here by retsoor – Fascinating, great choice of black and white and a great composition. My only comment really is that it could, again, be a bit darkened down as the images feels as though it should be less lit. ISO 51200 suggests that it was indeed very dark. 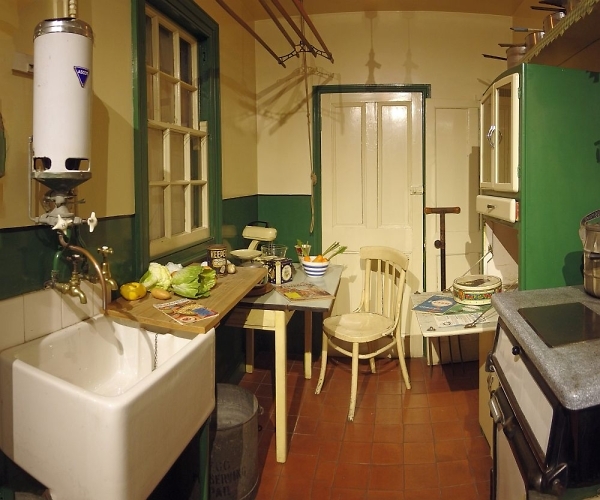 A 1940s Kitchen by JAK – There were plenty of places that looked pretty much like this when I was growing up in the 1950s/60s and some older houses probably still do. This is all in splendid condition though, as befits where it is, and a fine job has been done of recording it. The photographer totally gets away with combing two images and I suspect that no ordinary viewer would ever guess that was what had been done. The Back of the Cupboard by Abe-Normal – Shot yesterday, very impressed! I think we can be reminded of Michael MacIntyre's Five Spice story here, all those disused items. Why do we keep them? The “Best Before” dates might make us shudder with horror as well. Looking at the EXIF data this was clearly a tripod shot (13 seconds exposure) but I feel it should be crisper and I think the subject cries out for cutting sharpness. If the original does have that sharpness, then perhaps try uploading a larger file. Our Stanley/Masai/In the camp kitchen/Kenya 2005 by vic cross – Wow, love that colour and love the steam, it all works together to give a very pleasing overall effect. Do we need all the space on the right? My only doubt is that we seem to be peeking round the tree at the main subject and I wonder if it wouldn't be better if we were around the tree and facing the main area more directly. But having said that the overall feel of the image is great. No Cooking Today by noelcmn – A well assembled still life, correctly exposed and showing some really satisfying texture throughout. The Winner is JAK with his 1940s kitchen. Well executed in every respect. Second Place goes to Nigelk and the Field Kitchen. Really interesting and well produced photojournalism. Third Place is awarded to GlynM. Well done, a brilliant idea, and much appreciate the alternative concept to the TV. And two Special mentions for vic cross (great colour and feeling in the image) and retsoor (fascinating black and white shot). Many thanks everyone and now I pass the baton to JAK! Wonderful choice of winner, reminds me of the bachelor flat- crowded for space! My eyes are exploring all the possibilities here, from clothes hanging to brewing some beer . Lovely documentary shot! Congrats JAK, worthy winner! And extended to NigelK and GlynM for their excellent submissions too! And of course the special mentions Vic Cross and Retsoor. And thanks to our judge for the ever-so-interesting challenge and the CC's. Much appreciated as usual. Well I never! Thanks John. With all the other excellent images I wasn't expecting to be on the top of the podium. Shame there weren't a few more submitted but they are what they are. My personal favourite was Glyn's Watching His Cakes Rise, Also well done to NigelK for his second spot, the HMs and indeed all who entered. Now it's thinking cap time to up with a subject for this week. Great comp. this week. A lot of good shots. Thanks for the mention John. It was just a quick SNAP shot when Stanley wasn't looking. He was camera shy. Straight out of the camera. No PP. Not bad for an *istD. back in 2005. Good competition, thank you for the judging and my second place John, I can't argue with your comments, in the end I decided to enter it as it was shot, stray bits of leg, head and all, the cheque is in the post. Congratulations to fellow podium places and HCs. Many thanks John for another excellent competition and for awarding my entry the third place . Congratulations to our winner JAK, Nigelk for 2nd place, the special mentions and everyone else for another well crafted collection. Hi John, thanks for this competition, lots and lots to look at with many 'I remember that' moments and for your helpful comment which I'll work on. And of course my congratulations to JAK and runners up and HCs, great stuff!